Leryn, the bard, had only recently arrived in the village of Bleakbourne on Heath in search of new and interesting tales and was staying at the Ploughman’s Inn. He’d thought himself unknown in his craft, being a new-made journeyman, and was pleasantly surprised when the note had appeared on the writing table in his room, ordering him to appear before a local lord, Lord Tenneriff, to help with a matter of some urgency. He assumed his landlord had placed it there. Leryn had never heard of Tenneriff, but his masters had taught him to be agreeable to the nobility no matter what. Accordingly, he set out for the keep. The note instructed him to go some small distance out of town, and take the less used road south at the crossroads. On seeing it, the size of the keep surprised him, for two reasons. First, the long road leading to it was exceptionally “less used,” overgrown in fact. Second, he was surprised because he hadn’t seen the immense, dark ramparts from the high road. But, he reasoned, he surely would have, if he hadn’t been thinking of the innkeeper’s comely daughter. Oddly, the castle seemed deserted. 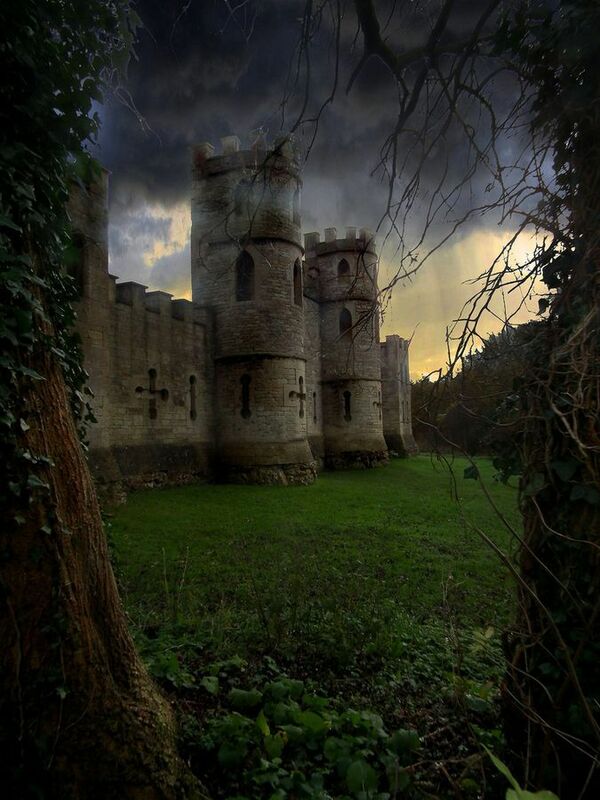 No one prowled the unkempt gardens, no steward guarded the portal, and no footman greeted him. He hurried as fast as he was able, climbing the steps to the heavy wooden doors, wondering what he was going to be required to do. Clutching the missive, Leryn screwed up his courage and opened the door, wondering if he would be accosted for trespassing. The door swung open, revealing an immense hall; dark, silent, and cold. Through the gloom, and the dust that hung in the air, Leryn could make out at the far end the figures of a large number of lords and ladies. They were seated, illuminated by the meager light admitted by the high, narrow windows. No fire burned in the great hearth, no victuals steamed on the board. Although the assembled nobles must have seen him as he entered their hall, no welcome was offered the bard. No small-talk passed between the assembled guests, and he thought perhaps they were engaged in some obscure parlor game that only the nobility would find entertaining. He passed between their tables, and they gave no sign they were aware of him. Wondering what parlor game they were playing, he thought, Tenneriff sent for me to come with all haste. I expected an emergency of some sort, yet this place is a lively as a grave. Even their breathing was silent…as if…. Only then did he realize that something was terribly wrong in that keep, and an insatiable desire for knowledge overpowered his dread. He was driven to discover what it could be, despite knowing he could be springing a trap. Leryn walked toward the high lord’s throne. His courage nearly faltered, sharp fear gnawed at his innards, but curiosity won. Slowly he approached and his footsteps echoed. His blood chilled as he neared the dais, seeing the waxen features and fine clothes of the ladies and their gentlemen. While they did not seem dead, they showed no signs of life. He wondered what fearful thing had occurred, to leave such a dreadful mark on the assembled guests. At last he reached the table where the lord of the manor sat, as pale and unseeing as his noble guests. “My Lord Tenneriff, I am Leryn, the Bard, here as you have requested.” Though he spoke quietly the bard’s voice seemed overloud in the silence, faintly echoing. There was no answer, no flutter of eyelids, and no intake of breath to indicate the lord of the manor was aware of his presence. Slowly the bard walked around the assembled nobles, seeing them as living, yet dead. As his eyes became used to the gloom, he saw that a fine layer of dust covered each of them, as if they were life-sized dolls, long abandoned on a shelf. At last his eyes were drawn to the wall behind Lord Tenneriff. A tapestry should have hung there, but instead he saw symbols, written on the stone in an arcane and mysterious language. As he looked the cyphers seemed to gain an insubstantial, green phosphorescence; a faint, evil glow. Overcome by fear, Leryn turned, bolting from the hall, and out into the chill of the late afternoon. Terror propelled him and he ran until he came to the hilltop and the road that led back to the village, where he stood gasping, trying to comprehend what he had seen.. Some instinct made him turn to gaze back at the keep from which he had come. As he did so, the sun set and deep twilight closed in. A bell tolled and as he watched, the keep he had just vacated shimmered, and vanished, leaving no sign it had ever been there. Panic took him again and he raced back to the village, arriving at the Ploughman’s Inn out of breath and shaking like barley in the wind. Leryn drank deeply, gathering his nerve before he was able to say what he’d seen. At the end of his tale he said, “I don’t blame you if you disbelieve me. But I swear on my grandmother’s grave that what I have told you is the truth.” He produced the letter instructing him to make himself available to Lord Tenneriff. Leryn fetched his writing case, and laid everything out . The innkeeper went back to polishing his woodwork. Connie J. Jasperson is an author and blogger, and a regular contributing member of the Edgewise Words Inn staff. Fun story. The first of many tales I hope. I have another set in that mysterious town in the works right now! Enter your email check into the Inn and receive notifications of new posts by email.